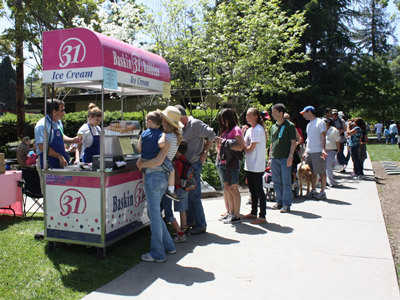 Our self-powered ice cream cart provides a unique ice cream party experience for your guests. We can do single or double scoop cones or ice cream sundaes. Or offer your guests an ice cream sundae bar where they can make their own sundaes. It's a great option for kids' birthday parties and corporate parties and events. We also do fundraisers for schools, teams, or charities. We sell the ice cream to attendees and donate 20% of the proceeds to your charity. We will be happy to work with you to make sure your event is successful! Let us take care of ice cream delivery to your event or party. With our ice cream cart, the ice cream will stay cold during your party. No more melted ice cream! Available to entire San Francisco Bay Area including Mountain View, Los Altos, Palo Alto, Cupertino, Sunnyvale, Santa Clara, and San Jose. Ice cream parties are great for kids birthdays, corporate parties, sports teams, and school events. Minimum: $275, which includes 1 hour of cart time, one server, and 40 single scoops. For longer parties: $140 second hour, $125 per hour after the second hour charge, not including food costs. 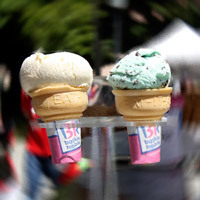 Community events with groups of 400 or more: No up front costs if selling ice cream. Please call (650) 940-9831 to set up your event today! Great for kids birthday parties, adult birthday parties, sundae parties, sports events, corporate parties, corporate events, and corporate birthday parties. How about a 50's style party with a classic ice cream build-your-own-sundae bar? 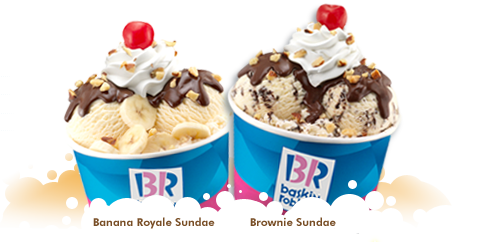 Choose the flavors you like such as cookies and cream (oreo), chocolate, vanilla, strawberry, mint chip, rocky road, and many more.